How do you assess the German government's appetite currently for wind energy? It's a difficult question to answer because it can always be more. I think the government is pushing this technology, I think they know quite well that this is a technology that can help us in Germany be in front of development, and they really want us to keep up that tradition. On the other hand, there are always issues where we complain and we see possibilities that the government could push it even more. But in comparison to other countries, I think the German government does quite a good job. Do you think that environmentalists are still mostly pro wind energy or do you think there's been a pushback regarding the difficulties in disposing of wind turbines? I think we have more and more problems with the issue of acceptance. I wouldn't say it's because of the disposal issue, I think it's more on issues like noise or the lightning effects during the night, that people feel disturbed. I don't think people think so much about the disposal issue, although it might be important and I also think that we have to address this issue. From my point of view, what I feel from the publicity, I don't get much pressure on that fact [disposing of wind turbines]. We don't have any projects on that, and in fact it's a mirror of the situation of the need that is communicated. If people would think it's a very necessary task to do [research on wind turbine disposal], then they would ask us for projects to do so and then we would do that. We are a publically-funded research organization and we feel it is our mission to work on topics that are asked for. But since this issue is not so much addressed, we haven't done anything there yet. That might change. Dr Jan Tessmer is co-ordinator on wind energy research at the German Aerospace Center (DLR). This interview was conducted by Melanie Hall. A recent report by the World Wind Energy Association, WWEA, showed the number of wind turbines built in 2012 was the highest number ever recorded. Most of them were erected in Europe, Asia and North America. Now, the industry is picking up in Latin America and Eastern Europe as well. About a hundred countries use wind power, which now covers three percent of the world's electricity needs. Supporters of wind energy say that the technology is envionmentally friendly and presents fewer safety risks than other energy options. In terms of energy security, wind power is considered an affordable option for countries that are trying to reduce their need for imported energy. One kilowatt hour costs between five and ten euro cents. 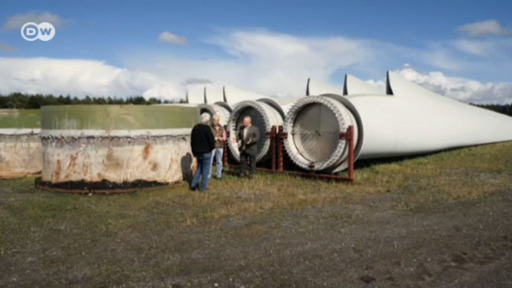 Wind turbines now come in many different sizes. Smaller wind turbines can be used to power a small village or just a few houses, like here in Peru. Demand is growing and new technologies in this sector are becoming more broadly available. At the top end of the wind power industry things are really picking up. Commercial wind turbines are getting bigger and bigger. This device can produce 3.4 megawatts of power - enough to provide electricity for 1900 homes in Germany. Inland wind energy use has experienced an upswing in Germany. The country is a leading producer of tall turbines, with larger blades, that even work in forests and areas with low-winds. Offshore wind farms are still something of a rarity. Installation and maintenance is difficult, energy production costs are almost twice as high as those on land. So far British offshore wind farms are the most productive, generatng three gigawatts of power annually. But the industry is seeing growth here: half of the world's offshore wind turbines were built in 2012. Denmark is one of the world's most prolific users of wind power. Some 30 percent of Denmark's electricity needs are covered by wind. That figure is expected to double by 2020. Experts believe that wind power coverage of 40 percent of the world's electricity needs should be possible by the year 2050. New technology has made it possible to create hydrogen gas from wind-powered electricity. This gas can then be stored and used at a later stage. Being able to store renewable energy, so that demand can be accommodated even when there is no wind, is very important if Germany is going achieve the goals of its 'energy turnaround' (known in German as the 'Energiewende'). Who does the wind belong to? In Germany, many wind farms belong to locals. Here in the small village of Schlalach, residents share in the profits from the sale of the electricity produced by their turbines. Experts say these projects ensure a healthy future for wind power by improving the acceptance of wind turbines in local communities. Some 100,000 people are employed in the German wind power industry. China and the United States have the most wind farms of any country worldwide. The most important meeting of wind power industry experts occurs at the 'Wind' trade fair in Husum. About nine percent of electricity needs in Germany are covered by wind power. With new wind parks being planned across the country, that figure is expected to climb over 16 percent by 2020. Erecting a few wind turbines on privatized, once communist farmland doesn't entitle Germany to claw back potentially lucrative power earnings, a top appeal court has ruled. It's voided part of a 2005 land sales contract. Disposing of old wind turbines is a big problem – not only are they deeply embedded in the ground, but getting rid of them releases dangerous dust. Now a firm in Germany has developed a way to recycle the rotor blades. On this week's eco@africa, we see how volcanic rocks are offering a greener alternative to damaging charcoal cooking, we meet an artist turning fruit waste into art and learn how to recycle wind turbines.